On the way home, a computer of the funeral spaceship Charon wakes up the crew from their cryo sleep after it detected signs of life in ship’s morgue. Horror genre involving creatures is under-appreciated. Same goes for horror in space. There's a swarm of vampires, zombies, shapeshifters and whatnot, for years, which is getting a bit tiresome. I wanted to write something different, yet familiar. I wanted to write something that I would gladly read. 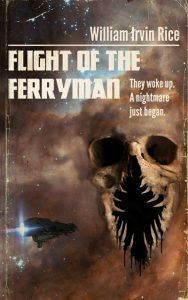 My book was inspired by movies such as Alien and The Thing, as well as video games such as Dead Space and Alien: Isolation. I wanted to place ordinary people in extraordinary circumstances. I tried to depict each character different, with own traits and mentality, so before writing process, I made detailed character boards, even for the characters that appear in just couple of scenes. What I dislike as a reader is when characters speak same tone, so I tried to avoid that and made the character development as better as possible. Left alone, Martin was watching as the captain's square-shouldered figure moved away down the corridor they had come from. He then slowly turned toward the exit that was supposed to take him to the morgue. Sweat dewed his forehead and temples. Martin wiped it with a forearm. Should I call Kirby, was his first thought, when he pulled himself together. No. Captain would scold us both because of it. If captain wanted, he would send us both. But, why did he send just me? Usually, we go together. After all, the captain could go down and check himself. He must be chickening out. Who knows what's going on in the infirmary and in what condition the other miner is? What will I find in the capsule? Martin quivered from head to toe. Ominous thoughts were swarming him as he went down to the third level. The sound of a digital bell scattered them when the elevator stopped. The technician shuddered. He peered down the corridor. His movement activated the light on the ceiling. Martin slowly went down the glittering tunnel toward the morgue, service area, and the engine room with the reactor. Activated by his proximity, a metal hinge on the doors clicked, opening them with a loud sound of pressure. Behind them was a wide foyer, illuminated only by faint light of the emergency lamps. Ahead, Martin saw a door leading to the morgue. An eerie glow of fluorescent light reached through the glass opening on them, flickering like a strobe light in slow motion. Thoughts of going back went through Martin's head almost immediately. He swallowed a lump and took a deep breath, before he made one hesitant step forward. Motion sensors registered him and a foyer blinked with a bright fluorescent light. The morgue doors remained in the shadows. Flickering fluorescent glow inside became fainter. Martin was walking slowly toward them, trying to delay each following step. Still, the creepy light was approaching, as if the morgue was going to meet him, not the other way around. He stood in front of the numpad and began typing numbers with his shaky hand. Six, he said to himself. Two, then again six, and then… His finger slipped, and instead of five, he hit eight. Martin cursed quietly. Cold sweat ran down his back. He deleted the entry and typed again, this time the right number. The doors loudly sibilated, letting the cold outside. Martin stiffened when an icy breath touched his sweat-soaked clothes. It was like someone from the deepest abyss of hell blew on him. Trembling, he slowly went to the morgue. The door closed behind him. Outside, the lights went out, leaving the foyer in a gloom of dim reddish light. From the ceiling of the morgue, lamps still cast a shaky fluorescent light, making everything before Martin's eyes dance in bluish silhouettes and shadows. He was looking around frantically, as he slowly moved inside. He thought he saw a figure in those dancing phantasms of light. A figure whose corpse he came to check. At one point, it was crouching in the corner, crawling up the ceiling with the following flicker of light. Finally, it slid right in front of Martin, reaching toward him with its dead, icy hands. Martin shivered, but it wasn't cold that paralyzed him, but horror, hopeless and all-pervading. He stopped in front of chamber 34 with the second miner inside. He saw the green light of a sensor above. It's ok, he's dead, thought Martin, remembering the captain's words almost immediately. He didn't care for the sensor. I have to check it. Martin inhaled deeply, holding his breath. Cold air gashed his lungs like a knife. Feeling shivers all over, he opened the chamber. Woolly vapor came out. Martin didn't feel how cold it was. Paralyzed, he was looking inside, at the capsule covered with white, frozen skim.